George Zimmerman Seeks 'Stand Your Ground' Hearing In Bid To Dismiss Case : The Two-Way The man charged with second-degree murder in the death of Florida teenager Trayvon Martin will argue he was in fear for his life when they encountered each other. If a judge agrees, the case could be dismissed. 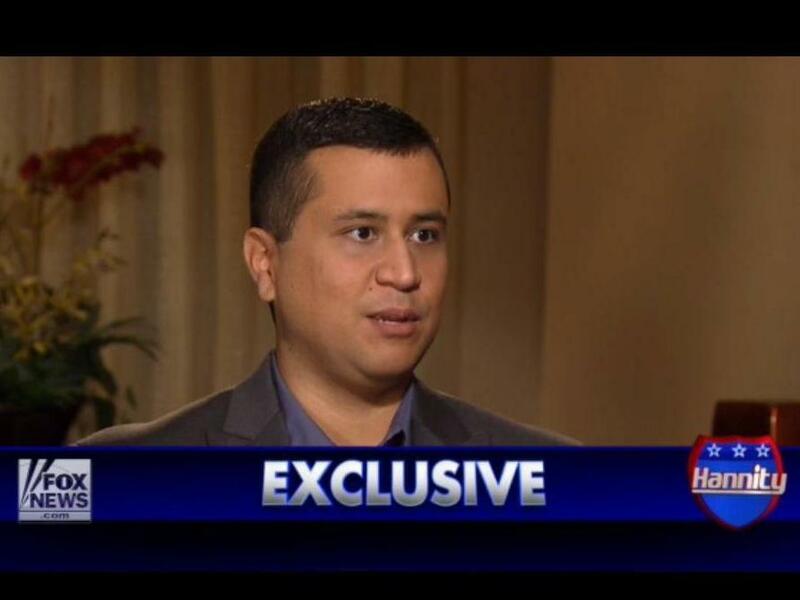 George Zimmerman during a July interview with Fox News' Sean Hannity. George Zimmerman, the man charged with second-degree murder in the death of Florida teenager Trayvon Martin, is going to ask for a "stand your ground" court hearing in an attempt to have the case against him dismissed without ever going to trial. Mark O'Mara, Zimmerman's attorney, confirmed the news this morning in an announcement on his client's legal defense website. From All Things Considered: More on "stand your ground" laws. As NPR's Greg Allen reminds us, "under Florida's stand your ground law, people involved in violent altercations have no duty to retreat. If a person is in fear of death or great bodily harm, the law says he or she can act in self-defense and is immune from criminal prosecution." Greg adds that the hearing "likely won't he held for several months." "In a 'Stand Your Ground' hearing, there is no jury; the decision is made by the judge alone. In a criminal trial, the prosecution must prove the defendant's guilt beyond a reasonable doubt, but in a 'Stand Your Ground' hearing, the burden is on the defense to prove that the evidence fits the conditions of the 'Stand Your Ground' law. If the Court rules in favor of the defendant in a 'Stand Your Ground' hearing, not only are criminal charges dismissed, the defendant is also immune from civil actions related to the shooting. The primary focus of a 'Stand Your Ground' hearing is whether George Zimmerman reasonably believed that his use of his weapon was necessary to prevent great bodily harm to himself at the hands of Trayvon Martin." Zimmerman shot and killed Martin on Feb. 26 in Sanford, Fla. While expected, today's announcement is "the first time Zimmerman's attorney ... has publicly acknowledged his intention to argue the case on the grounds of the controversial Florida law," The Orlando Sentinel says. The Sentinel reports that "Benjamin Crump, the attorney representating Trayvon Martin's family, released a statement this morning saying that the family feels 'confident that the unjustified killing of Trayvon Benjamin Martin should and will be decided by a jury. ... A grown man cannot profile and pursue an unarmed child, shoot him in the heart, and then claim stand your ground.' "
Also today, prosecutors released 76 pages of evidence in the case against Zimmerman and then withdrew most of the materials from the Web. Officials said the materials had been released "prematurely." The Sentinel writes that there are no "bombshells" in the materials. It leads its report on them with this: "Authorities found Trayvon Martin's blood on the bag of Skittles he had in his pocket."